What’s in a name? Cannibal Corpse, Cradle of Filth, Morbid Angel… you don’t need to be a genius to have a guess at what they’re going to sound like. 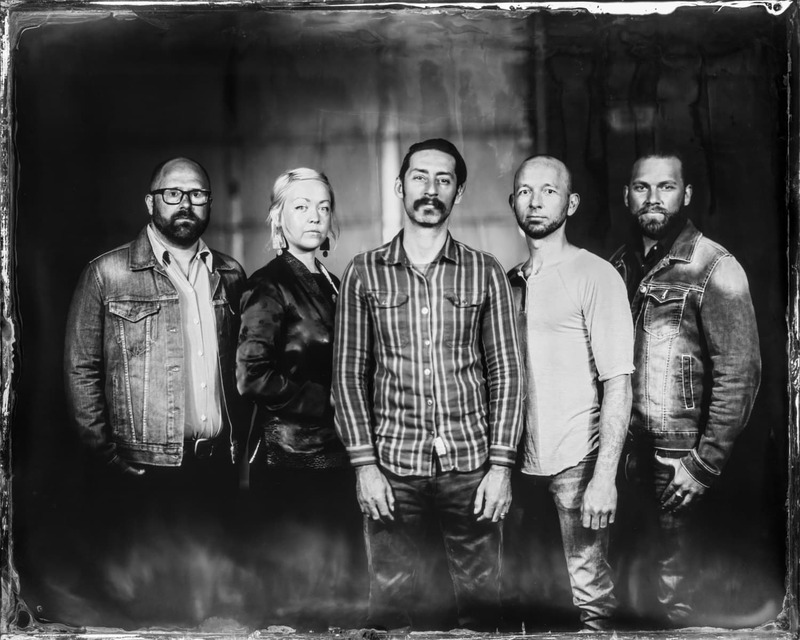 Some might assume a band that would call itself Murder By Death would fit in the same bracket, but the Indiana quintet couldn’t sound more different to the punishing assault of death metal. In fact, for a band that can prove impossible to define, it’s something of a masterstroke to choose a name that completely wrongfoots listeners from the off. You certainly don’t come in expecting accordions, cello and a baritone to rival Nick Cave and Leonard Cohen. 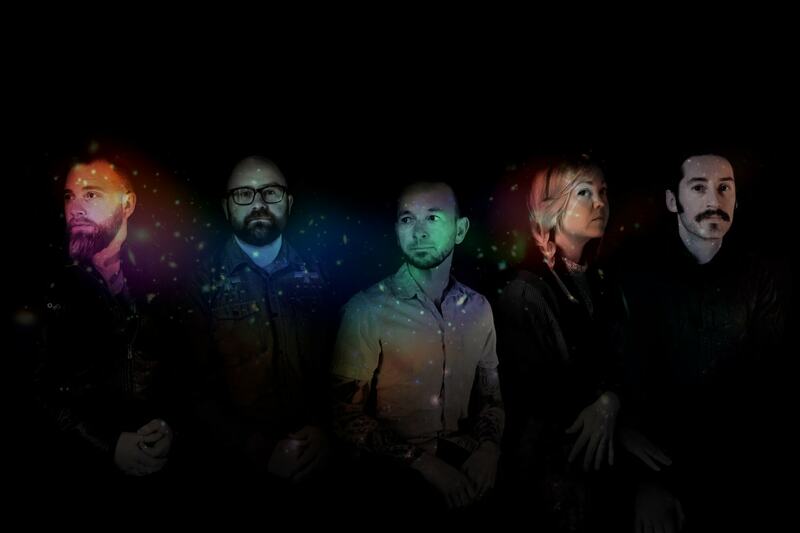 Concept records, pioneering Kickstarter campaigns, Shining-themed formal balls… Murder By Death have spent 20 years doing their own thing and accumulating a passionate band of die-hard fans in the process. Impressively ‘tached frontman Adam Turla takes pride in the band’s stubborn adherence to its own path, even if it means they haven’t reached as many fans as they deserved to. Their latest album shows no sign of compromise and no concession to convention. 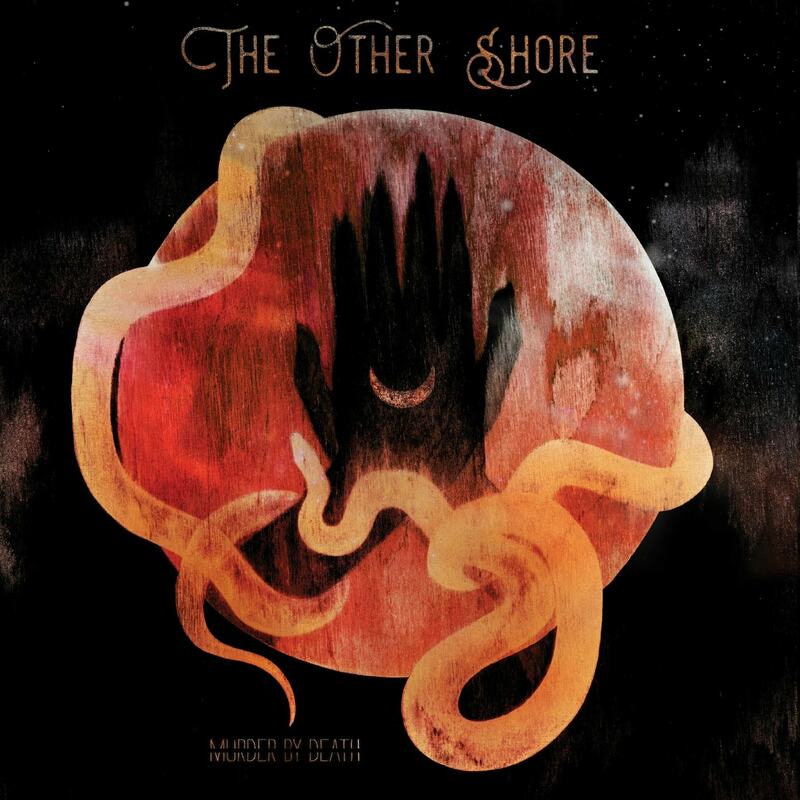 The Other Shore is a space opera about a relationship dying in tandem with a planet, one venturing out to find a new world, the other staying behind in the husk of the old world. It’s overwhelmingly ambitious and hugely impressive in how it functions both as a complete piece and as individual songs. We spoke to Turla on the phone to chat about The Other Shore, Kickstarter campaigns and putting on a formal ball at the Overlook Hotel. Is your most recent album always your favourite or do you need some space to be able to evaluate it properly? I think when you’re writing it, it’s almost always your favorite. But like everything in life, a little reflection makes you think about the things you wish you’d done. Or when you play it live, the way that people react to an album can affect how you think about it. It’s not that you gain any real objectivity, you just start being pulled in different directions. It’s hard to have a favorite of something you made. Being someone who makes things, you want a lot of people to love those things. It really does affect the way that you view what you do. I know that when I talked with my band about this record, they were all really excited about it. I think as a group, I saw more excitement about this one than really any of the records, and I'm really happy to hear from fans that it's definitely a favorite. People love all of our records and have been coming to dozens and dozens of shows, or hundreds even have come with us and told us, "This is one of your best records." To hear that early on is a great sign. It's pretty cool to have something 19 years into our career that people identify with that much. You worry that you're always fighting nostalgia, so it's great to hear that people are saying, "No, no, this is good because it's good." Right, yeah. A guy I know tweeted to Titus Andronicus a few years back that he thought their first record was their best, and basically got told to go f*** himself by their frontman Patrick Stickles. That's what's so funny, it's just not the thing that any person wants to hear. It's really interesting that people infer it a lot in general. I think there used to be a cool factor about like, "I know your early stuff." Well see, the internet's out there man, that's not cool anymore, anybody can hear anything at any time, you know? That's very true, you can find basically anything by anyone, which is kind of terrifying I guess, as well. Exactly, so you're not saying "I've been with you since the beginning." I think that was the idea, back in the day it was sort of a complement to say "I've been following you forever and I still love your old stuff" but what you're really actually saying is "F*** everything you've done this decade." We don't get a lot of hate, we're lucky, but I hear bands all the time that I know that are stuck because everybody just likes something they did a long time ago and they're frustrated because they're trying to do their best work all the time. I can't imagine what it would be like to have people only care about something you did a long time ago. We've tried to combat that our whole career by kind of just always moving forward. Hopefully if we try to be honest and straightforward with our music and try to keep it feeling like our music, then maybe we won't go away." The music industry has changed a lot and bands aren't beholden to labels in the way that they used to be. Do you find that you have to worry less about labels or media trying to force you to fit into whatever's cool? Oh yeah, and we never had that. I will say we're grateful. I think again, by starting out being like, "We're this weird band" we never had some big label trying to fit us into a mold or saying "You gotta do this." I never had anyone from the music industry tell me how to do something, you know? I know plenty of bands who are being pushed in one direction to try to write the Zeitgeist or whatever. But for us in our case, it was always like, anybody who was actually gonna work with us just kind of had to be onboard, and basically were just like "I like this band and I will work with them" or they just didn't work with us. So I think that's pretty cool in that regard, 'cause the decisions have always been ours. And even our mistakes have been ours too, but I don't have a problem with that. I like that. I guess they're easier to own when they're just yours, when it's not something somebody made you do. Right, it’s our life. We earned our successes and we earned our failures and I think it's great. It's just the way we do everything, I mean I business manage the band, I make all those choices and I do the exciting stuff and I do the boring stuff, and we have great people who we work with. We really like our label, Bloodshot Records did our last three albums and they're celebrating their 25th year as a label and they're just such an honest, old school label that just really wants to do the best for their bands and not take advantage of them. We've had a couple times where we've almost signed with a trendy label and then later I find out that that label took all the money from the band and never paid the artist or whatever, and I'm just so grateful to not have one of those stories. You guys were very early adopters of the Kickstarter model to financing records. Yes. We basically thought we were gonna be the first indie band to do it, but we were working on a record deal at the time and they were like, "Wait, we don't want you to do it yet, push it back six months." During that time period, Amanda Palmer did her giant one, it was like the biggest music project for like, I think it's 1.1 million dollars. I was frustrated because everybody wrote about it, and we were ready to launch, all I had to do was click "Go". But we wanted to delay the release, which I think in the end was smart. But she got a lot of great press for it. It also gave me an opportunity to observe hers, and I did change things based on what I thought worked or didn't work from hers. We've basically done three now, and each one has gotten bigger than the last one, and the idea is the majority of the sales we're doing there are to our core fans. Then there're some other people that kind of get caught up in it and you pick up a few new fans by doing this sort of very visible platform. It's been cool 'cause you build this trust with people. I'll get interviews for business magazines who want to know like, "What's the secret to getting people to spend that much money?" It's like, "The secret is give them something worthwhile." Even if it's not their favorite album you've ever put out, at least make sure the customer service is good, make sure the art is cool and the packaging's cool and you throw in some extra stuff, just make it fun. It sounds like a cool, collaborative way of doing it, especially with the different rewards you can offer. That seems like a fun thing to come up with. It’s really fun. We did these cover songs where a fan who pledges a certain amount of money, we'll cover any other artist they want us to hear on any song. We just finished those up and we're mixing them right now. This latest batch, they really picked some great stuff. There's everything from Edith Piaf to Megadeth. It's all over the place. There's like a Frank Turner and an Against Me! song. We're actually friends with both those groups, so it's kind of fun to cover your friends without even choosing to. What's the weirdest one you've been asked to do? The weirdest… I think Megadeth was pretty weird. The hardest song we've ever had to do was an Oingo Boingo song. That song is just constantly changing just a little, like adding a beat or adding one little phrase. And it's six minutes long too. We left that session, not frustrated but just in awe of Danny Elfman, who does these crazy arrangements. We were just so impressed with his musicality. It was harder than ... We did Iron Maiden, we did Prince, but Danny Elfman was the one that just left us stunned at his skill. I would not fancy taking that on. Yeah. The engineer who recorded it, she was like "I don't think I ever need to hear this song again." I've picked up on a lot of film references, not just through obviously the name of the band, but also the series of Shining photos that you've done on Instagram. Yeah, we do that every year at The Shining Hotel. That’s actually the hotel from The Shining? Oh yeah, we do five shows there every year and this is the sixth year we’ve done it. It's a concept show we do every year. We sell 3000 tickets over five nights and it sells out instantly every year. It's crazy. And it's a formal ball; everybody gets dressed up in old outfits and it's really fun. It's a big deal for our fans, people travel from all over the world actually to come to it. Do you find you draw a lot of influence from outside of music? That's been a big part of who we are. It's a way to make your music something else, to explore what else is out there. It's like, it's a song, it's a story, it fits into another song, that can sort of expand the possibilities for how you write the song and what the arc of the song is. We try to pull from whatever media we find interesting at the moment and we've all been into sci-fi and I think that's pretty topical for culture, right now – potential Mars exploration and manned missions, that kind of stuff. 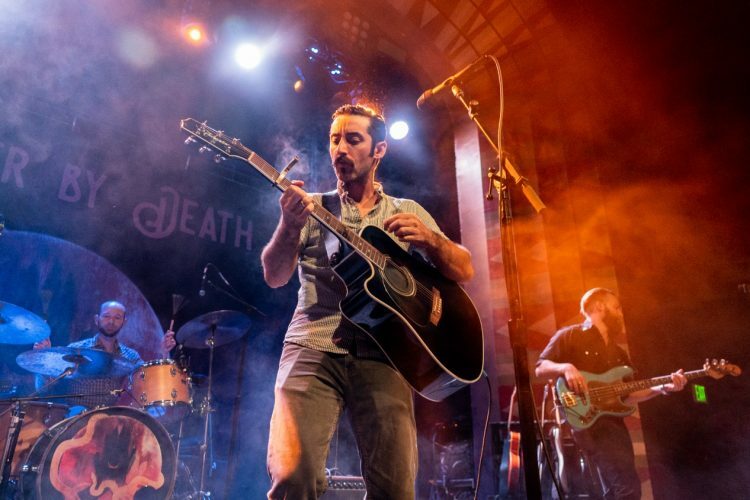 We think of every song that we've written as being part of the Murder By Death universe and we always have to find a way to make sure that it fits into the universe. For a record like the latest one, where it kind of fits into an overall concept, do you work out the narrative from start to finish for the record? I basically have been toying with doing a space opera for a long time. I started writing one when I was a teenager. I had songs that I'd written as a teenager and then I started writing a couple new ones, and I couldn't decide if I was writing a Murder By Death album or still working on my space opera. Then I basically started to realize the best songs that I was writing that were newer were just Murder By Death songs that told a similar story. I didn't end up using anything that was an old song, but I used those almost as a starting point. So the story kind of unfolded line by line honestly, and song by song. I was very careful, I really didn't think this was the way we were going with it, I kept fighting it, but also kind of nudging it along anyway and by the time we were about halfway done with the album, everybody was like, "So you're doing this right?" I've noticed you've got quite impressive facial hair. What's it at the moment? Have you still got the moustache? I’ve had a moustache for, gosh, man, maybe like nine to ten years now. I might shave it, I don't know. I had these huge mutton chops for a while. I've had beards, I've had a lot of different looks, but more in my 20s. I think I was like, "OK, I gotta just pick something." So I picked the moustache in maybe 2009 or 2010 and I just ran with it. I do think to some extent as a performer you have to at least be aware of some sort of style or something, 'cause you're up on stage and people are looking at you. I use a super tough pomade for live shows. My hair is super thick so I have to spray it down like crazy, 'cause I move around a lot on stage. I have to do something, otherwise I'm just flopping all over the place. My buddy who's a tattoo artist in LA took me to the barbershop that makes the Layrite and was like "This is the stuff you need Adam." I think he saw me looking ridiculous and not knowing what to do at a show in LA, and he's like "You gotta get this, alright."